The BioBlitz was a huge success, with over 700 identified species. Watch this space for a report. 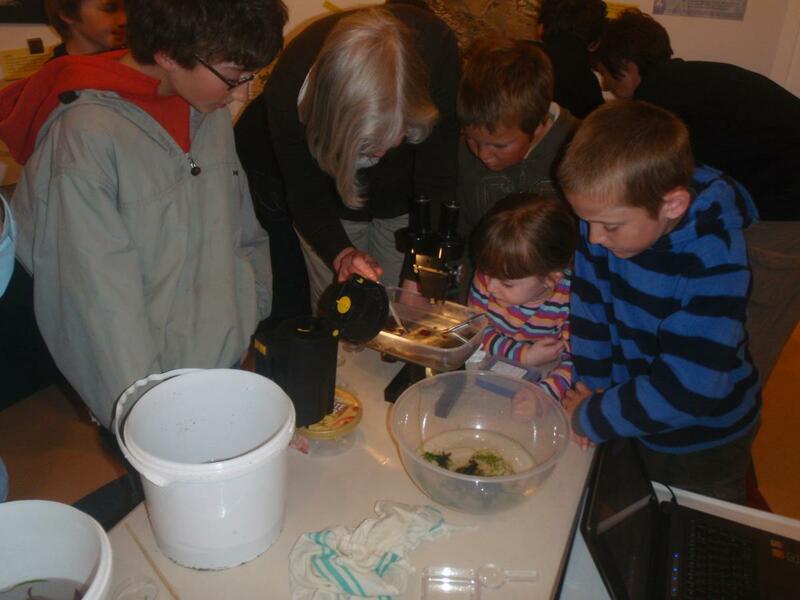 Activities will take place through - out, including: Microscopes, rock surveys, bat and moth detecting, plankton safaris and more! Meet for all activities at Base Camp. Either drop-in or contact us to sign up for the timetabled activities taking place. Dress for the weather. For night activities especially wrap up warm, and bring a torch and high-vis vest if you have one. Food and other refreshments will be available in the local village. Volunteering: If you are able to offer your time or expertise to help out with the event, get in touch ! but we’re a group that never quits. "When I arrived I was excited because I didn't know what a BioBlitz was. There were people scuttling like shore crabs and tents dotted everywhere like spotson a strawberry anemone”. Quote fromHamish Mello aged 9 after the WoolacombeBioBlitz. Like Hamish not many people do know what a BioBlitz is but just imagine a beautiful setting by the sea, there are people buzzing all around; naturalists and members of the public with just one aim, to count as many different species as they can in 24 hours. You don’t need to be an expert anyone can join in and be guided by those that are. So with two successful BioBlitz under our belts we embark upon a third, to be held at Lee Bay near Ilfracombe. In partnership with The North Devon Coast AONB Coastal Creatures project supported by the Heritage Lottery Fund and the Marine Biological Association we aim to make it another brilliant one. This is a free event and will be open to school groups from 10:30am on the Friday and then to the general public from 1pm. The BioBlitz will finish at around 3:30pm on the Saturday hopefully with an enormous species count. The programme has not yet been finalised but should include rock-pooling (noon & night), sea-watching for birds & cetaceans, plant forays, small mammal study, bug hunts, pond-dipping, moth collecting, looking at lichens and bat walks. 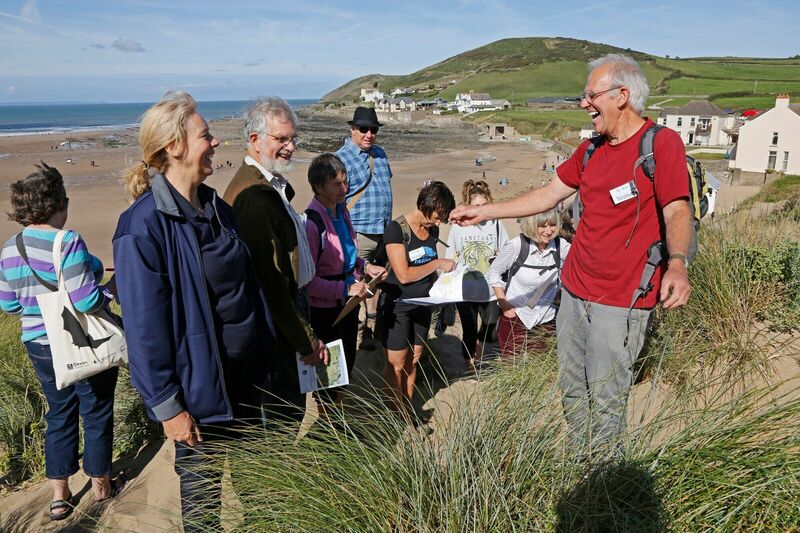 The AONB Coastal Creatures Project first BioBlitz at Croyde on Saturday 17th, organised by Coastwise North Devon, was a huge success, reaching out to the public and serious professional natural scientists. The event was aided by lovely weather and an excellent site provided courtesy of the National Trust with support from Ruda Holidays for some of the activities. for a local areas marine bioblitz. The Plymouth Marine Biological Association team reported that about half the records had been logged by the end of the day and 250 species already formally identified and recorded, 50 of which had not been recorded in the area before. Many more will be added, some requiring further study before identification is possible. Discussion with members of the public enjoying the microscope tent and guided rockpool rambles showed that there is real interest in the marine world, but people are at a loss as to how to pursue that interest. The Coastal Creatures project certainly has a ready-made target audience in the area. We'll be updating this report and adding pictures as the results become available. Coastwise North Devon is organising a BioBlitz to be held at Croyde on 17th September 2016, supporting the AONB's HLF-supported Coastal Creatures project. This is currently in the detailed planning phase at the moment, and is building on the experience gained from the very successful 2013 Woolacombe event (see below). Download the poster, and Programme for the day. Further information from Cat Oliver, AONB Coastal Creatures Project Officer - catherine.oliver@devon.gov.uk 07768214597, who's right at the centre of things. Note: this information is included to allow prompt reporting of the event, but will be updated as additions and corrections are received. 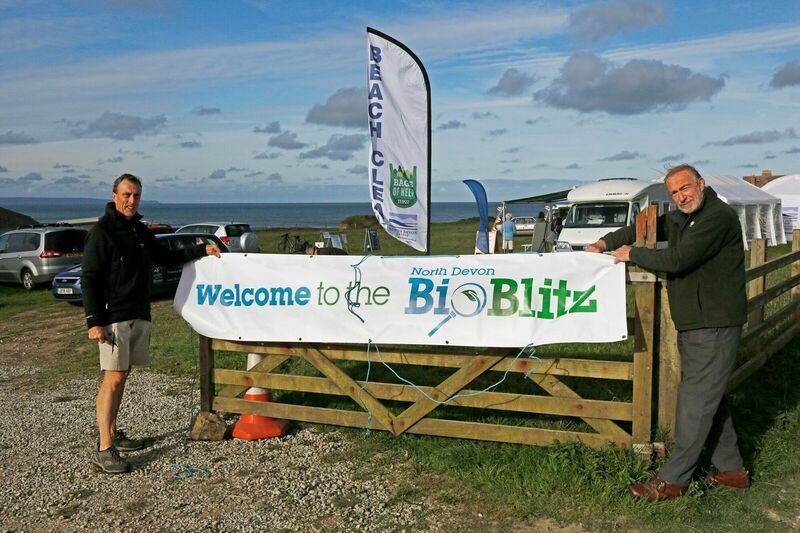 The 7th September 2013 Woolacombe BioBlitz was a huge success. Feedback forms were distributed and recovered: a sample comment was "....the only BioBlitz that I've attended that catered for the public....". "What is a BioBlitz ?" All the pieces are falling into place to make North Devon’s BioBlitz contribution to Biosphere celebrations a force to be reckoned with. The programme has been finalised, and there's lots to do all day......Click Here to download a full list. We are going to celebrate this “summer for nature” in great style. A new logo for the New Year got us going – with so many partners keen to help we needed a bespoke logo to be used alongside that of the Big Lottery, our key funder, having begun the year with an award from them of £4500. This meant we could get down to business knowing that our core costs would be covered. Coastwise and the National Trust respectively later also won £400 support from Fullabrook Community Fund and £1000 from the North Devon AONB for special kit for viewing and recording animal sightings, including a webcam and laptop computer. We thank them all. Parkin Estates Ltd has kindly given permission for use of Woolacombe Green, a prime coastal site at the heart of the village. The Biosphere’s superbly equipped science tent has been tested & will provide the focal point amongst a cluster of partners’ tents & displays. The event is all about organisations and key individuals working together. In the planning stage much of this falls to the National Trust’s Jonathan Fairhurst and Pip & Pete Jollands for the Biosphere Foundation, working alongside Coastwise Project Leader Jim Monroe and his team. On the day itself we will be calling upon naturalists and enthusiastic volunteers to deliver a full programme of activities. We have been delighted by the numbers who have already volunteered to help, including nearly 50 wildlife experts of land and sea, and at least as many volunteers keen to help on the day make it a success. 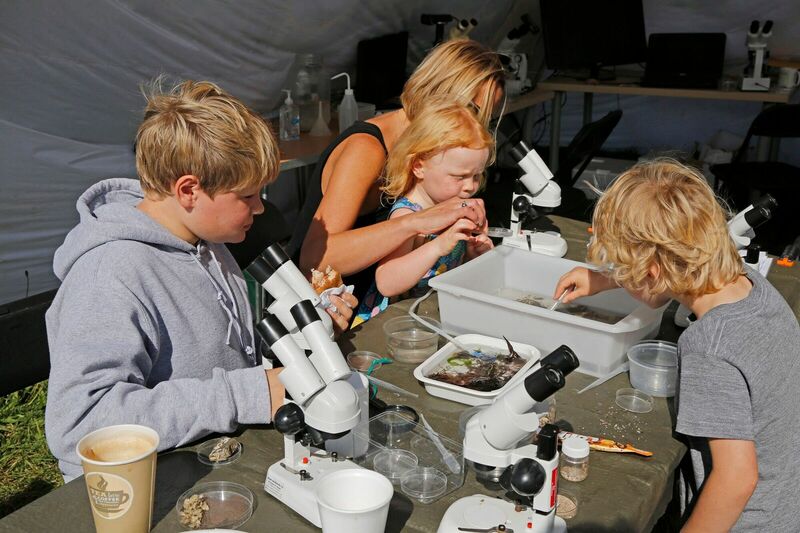 Thanks to them there will be activities on offer from 10am – 6 pm with collecting expeditions and i-spy walks fanning out round Woolacombe from Basecamp on the Green, where there will be an array of fun family activities alongside science-for-all in the tented lab. If you want to know more contact info@coastwisenorthdevon.org.uk. or keep watching this site. Best of all come along on the day to share in this unique event. 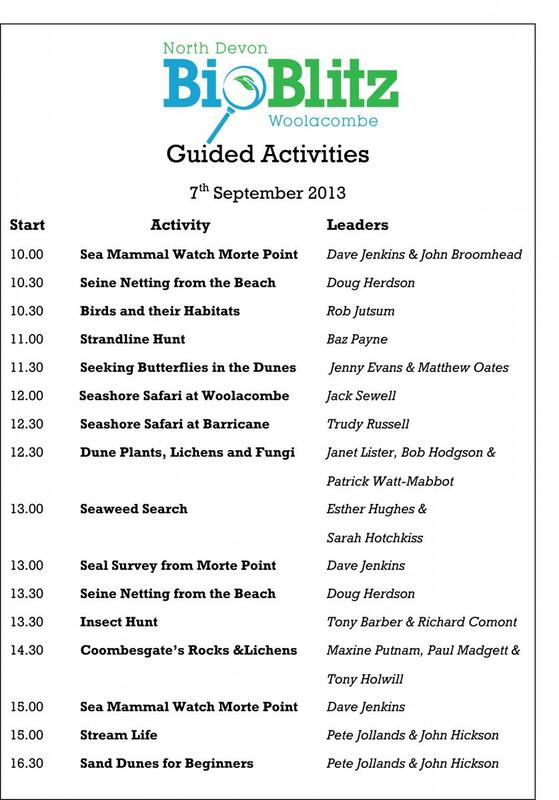 A partnership of local organisations co-ordinated by Coastwise will plan the BioBlitz at Woolacombe on 7th September 2013. 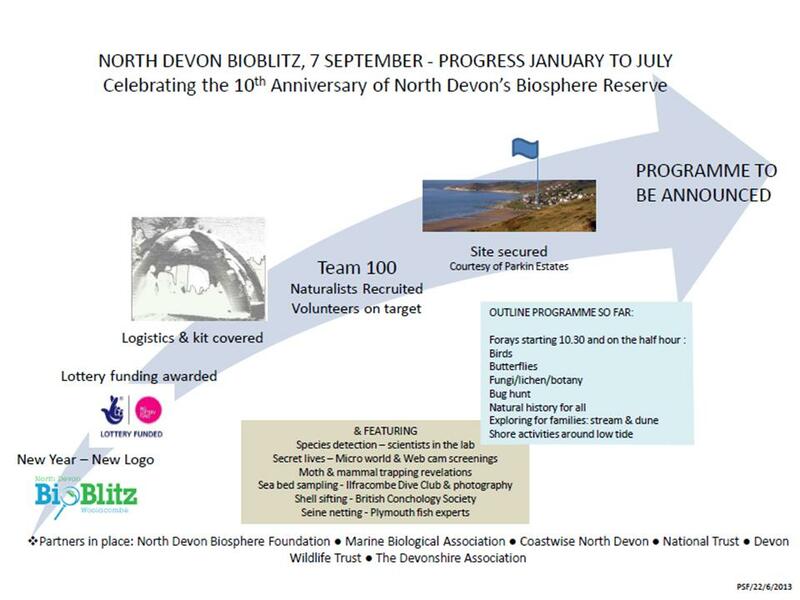 The BioBlitz is a 10th Anniversay Year Celebration event for UNESCO North Devon's Biosphere Reserve . Coastwise North Devon is organising the event, together with help from partners including Devon Wildlife Trust, AONB, National Trust and the Marine Biological Association. The first is a count of the plants and animals in a given location within a specified number of hours. For us this will mean a Saturday spent creating a picture of the marine and terrestrial biodiversity of a swathe of several key habitats from land to sea, focussed on Woolacombe. To help the public discover, learn and enthuse about the natural world. Our aim is to make this a special event – lots of species identified and lots of people enthused, – to celebrate the UNESCO North Devon's Biosphere new decade by putting people at the heart of activities, a community effort guided by experts, a contribution towards conservation through growing local knowledge and awareness. A full programme of public events will run throughout the day, recording, photographing, learning about and identifying plants and animals. The resulting data will be submitted to national databases and form part of the pack of learning material that will be developed from the event. Would you like to get involved? Do you have any suggestions for us? For example would your organisation welcome the opportunity to recruit new members and volunteers? Please give us your views, tell us how you would like to contribute, and send us any suggestions, any funding/sponsorship advice to cover the modest costs, or ask for more information. 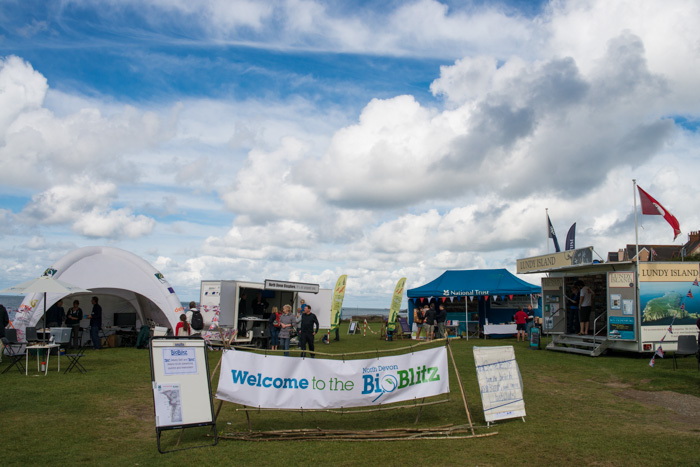 Coastwise will act as host to the BioBlitz, including what we're calling the "Base Camp" for the day on Woolacombe Green, on the edge of the beach at the centre of the town. We will be using the Biosphere Foundation’s superb new 8m portable dome and trailer, equipped with microscopes and other field studies equipment, providing a basecamp for the experts on hand to help and advise. In addition there will be our partners' marquees for a variety of other activities. There will be marine events led by Coastwise, and terrestrial events and walks led by the DWT and NT. Various experts in their fields will conduct surveys of marine and terrestrial natural life, and there will be chances to interact with them. For those coming from further afield, there's lots of convenient local accommodation; click here for a list which includes camping, B&B and hotels. It is planned to have lots to interest and involve families, and hopefuly spark an enduring interest in the natural world. Overall, the public and Bioblitz events will take place simultaneously with experts, volunteers and public all participating. Coastwise will coordinate all events , so keep an eye on this space over the next year as the programme develops.